Since I quit my job and had to get used to having extra time on my hand, I also had to get used to the fact that I got so much more lazy. Before I quit my job, I always thought and figured that when I would finally be free of my job and have extra time, it would also be the time where I would learn how to cook, go to the gym the whole time, write blogs and guides all day, and I was filled with all these overly ambitious thoughts and goals. The time came and I quit my job, and my ambitious goals didn’t quite happen as intended. I started sleeping more (Duh, I mean, who wouldn’t do that if they suddenly had the opportunity? ), I started watching more Netflix, and I started doing more online shopping. What I didn’t do more was getting things done. I kept on wondering how I could make it all work before. How could I work three jobs, and have time to see friends, go to the gym, and write a blog, plus getting some sleep sometimes, when now I got rid of my full time job which basically gave me eight free hours a day with nothing to do, and still I didn’t go to the gym more, cook more at home, or was more productive overall? I finally figured out the reason I wasn’t getting things done. I kept on postponing stuff. When you have all the time in the world, everything can wait at least one day. I would say to myself that today I have to go to the gym. When the time was in, I would change it and go, oh well, I’ll just go tomorrow, I don’t have anything to do anyway, and so this way, it would go for days before I actually stopped and found out how little I was doing and getting done. So — these Sunday thoughts are — don’t put off till tomorrow what you can do today. Why wait till tomorrow to do things when you can easily get it done today, fast, easily, and simple? 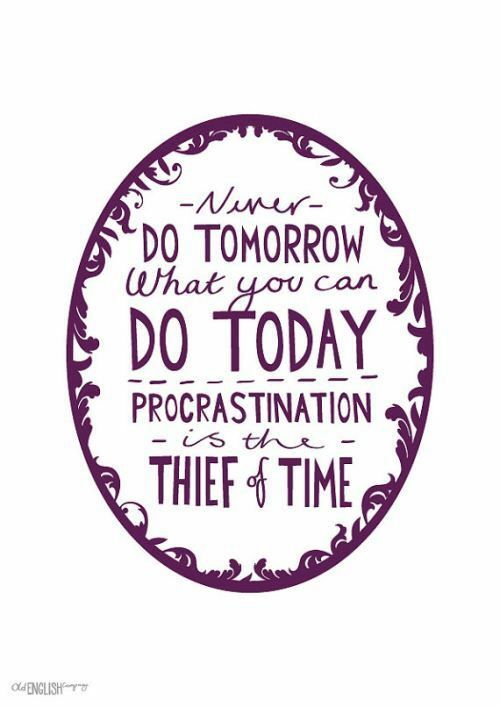 If you make it a habit to do things as soon as you have to, you will never end up with never-ending to do lists, or feeling bad about to much procrastination. Remember that you can’t get time back!